Global oil supply rose 0.8 mb/d in October to 97.8 mb/d after producers in OPEC and non-OPEC opened the taps. World oil output was 0.8 mb/d above a year ago, with higher OPEC supply offsetting non-OPEC declines. 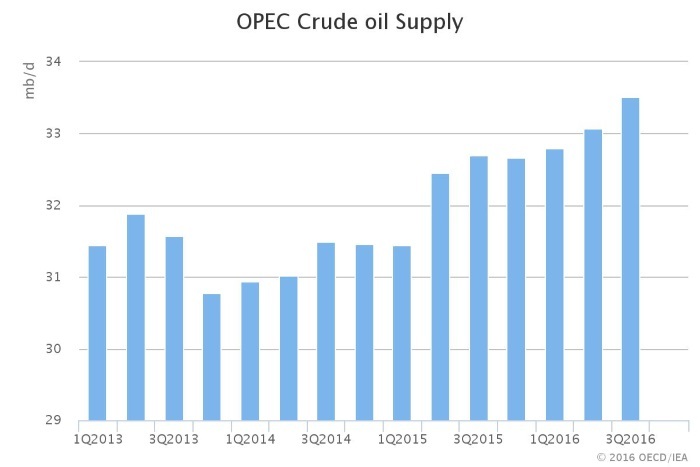 After declining by 0.9 mb/d in 2016, non-OPEC production is expected to grow by 0.5 mb/d next year. OPEC crude output rose by 230 kb/d to a record 33.83 mb/d in October after production recovered in Nigeria and Libya and flows from Iraq hit an all-time high. Output from the group’s 14 members has climbed for five months running, led by Iraq and Saudi Arabia. In October, OPEC supply stood nearly 1.3 mb/d above a year ago. Oil demand growth is forecast to ease to 1.2 mb/d in 2016 due to sharp slowdowns in the OECD Americas and China. A similar expansion is foreseen in 2017. 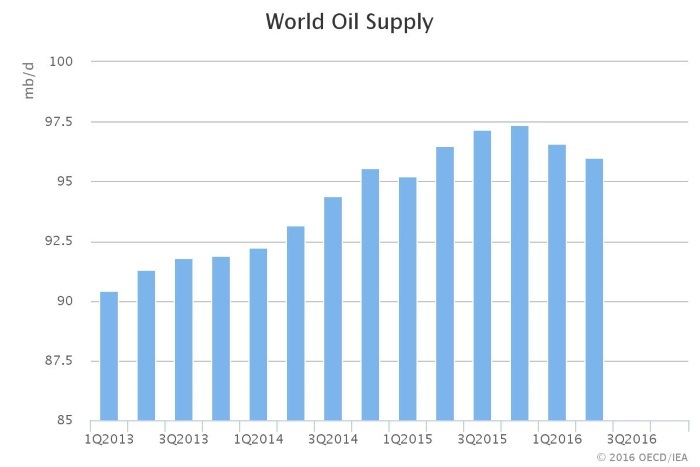 Oil demand peaked at a five-year high of 1.8 mb/d in 2015. OECD commercial stocks fell for the second month in a row in September, by 17.1 mb to 3 068 mb. In China, stocks of crude built by 29.7 mb in September. Initial data point to renewed crude stock builds in the US and Japan. Stock builds could continue through 2017 if OPEC does not agree to production restraint at its forthcoming meeting in Vienna. Global refinery runs are expected to fall by a seasonal 1 mb/d in 4Q16 to 78.9 mb/d, up 150 kb/d year-on-year (y-o-y).Annual growth of 270 kb/d for 2016 is the lowest increase in more than a decade. 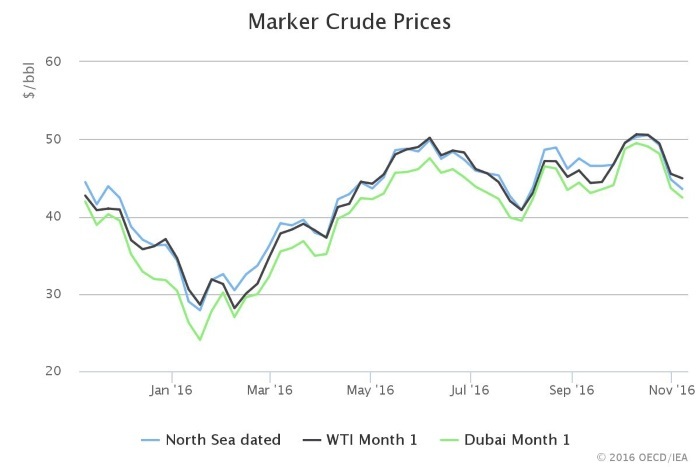 Benchmark crude prices followed a bell-shaped curve in October, rising in the first part of the month before erasing nearly all of those gains on doubts about the likelihood of an OPEC production agreement. At the time of writing, front-month ICE Brent was trading at $46.79/bbl. The issue that currently dominates the outlook for the oil market is the outcome of OPEC’s ministerial meeting in Vienna on 30 November. It has only been two months since OPEC last met in Algiers and announced it would examine how to set up a production ceiling of between 32.5 mb/d and 33.0 mb/d. OPEC also said it would seek to bring leading non-OPEC producers into the process. We can’t predict the outcome of the 30 November meeting, but we can see the scale of the task ahead. In this report we estimate that OPEC members pumped 33.8 mb/d in October, well in excess of the high end of the proposed output range. This means that OPEC must agree to significant cuts in Vienna to turn its Algiers commitment into reality. 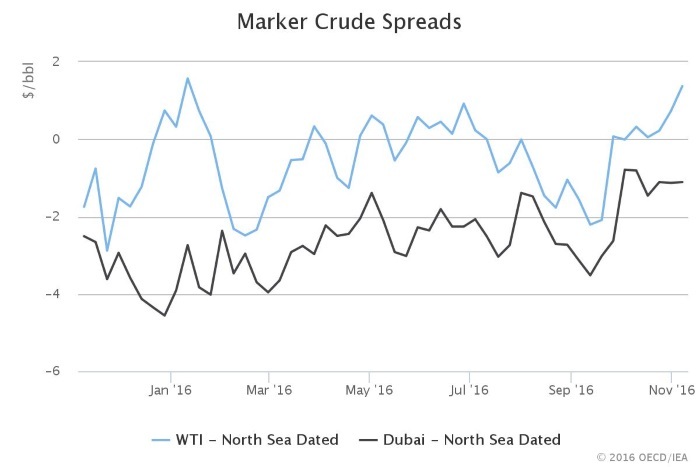 Whatever the outcome, the Vienna meeting will have a major impact on the eventual – and oft-postponed – re-balancing of the oil market. But it is not the only factor at play. Unfortunately for those seeking higher prices, an analysis of the other components provides little comfort. The world’s biggest crude oil producer Russia will see its output increase by 230 kb/d in 2016, and sustained production at current record levels would result in growth of nearly 200 kb/d next year. With production also expected to grow in Brazil, Canada and Kazakhstan, total non-OPEC output will rise by 0.5 mb/d next year, compared to a fall of 0.9 mb/d in 2016. This means that 2017 could be another year of relentless global supply growth similar to that seen in 2016. 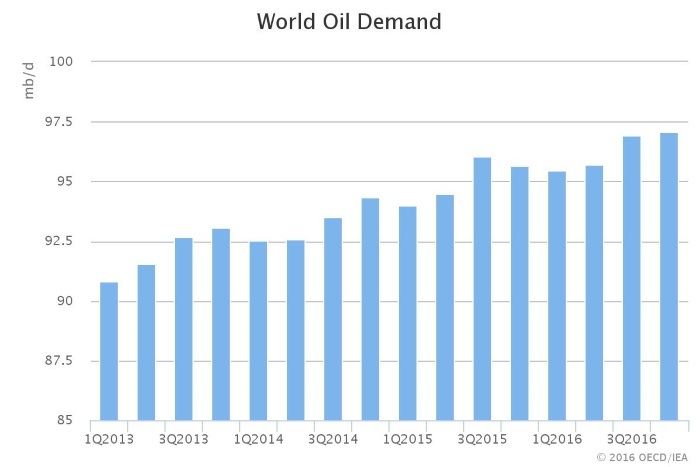 On the demand side of the oil balance, our outlook for world oil demand growth at 1.2 mb/d in 2016 and 2017 remains unchanged. There is currently little evidence to suggest that economic activity is sufficiently robust to deliver higher oil demand growth, and any stimulus that might have been provided at the end of 2015 and in the early part of 2016 when crude oil prices fell below $30/bbl is now in the past. 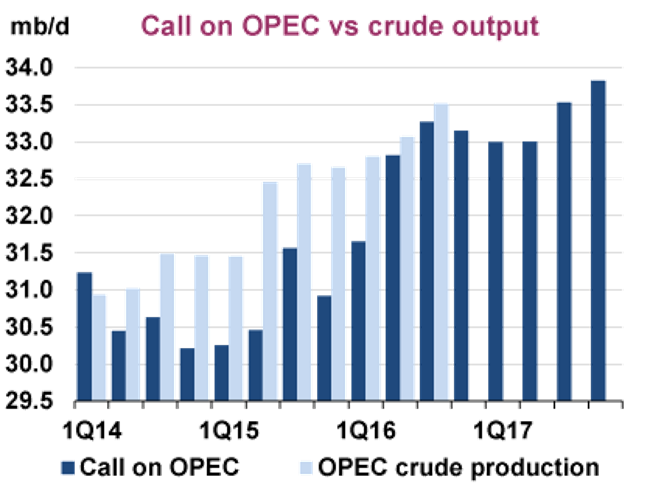 If the OPEC countries do implement their Algiers resolution the resultant production cut will see the market move from surplus to deficit very quickly in 2017, albeit with a considerable stock overhang that will take time to deplete. On the other hand, if no agreement is reached and some individual members continue to expand their production then the market will remain in surplus throughout the year, with little prospect of oil prices rising significantly higher. Indeed, if the supply surplus persists in 2017 there must be some risk of prices falling back. It is not the role of the IEA to urge any oil industry player to take one course of action rather than another, and we are not doing so now. Over time, market forces will do their job and the oil price will respond to the signals provided by demand and supply. What the IEA has argued for consistently is the need for investments necessary to meet rising oil demand. Such investments ensure that the market remains close to balance and that prices are as stable and as fair for both producers and consumers as can ever be possible in such a dynamic industry.